In a showdown of Spanish clubs, Valencia Basket recorded its first win in Group D by downing Laboral Kutxa Vitoria 79-69 at home on Friday. Valencia improved to 1-3 while Laboral dropped to 2-2. Luke Harangody paced the winners with 21 points on 5-of-7 three-point shots. 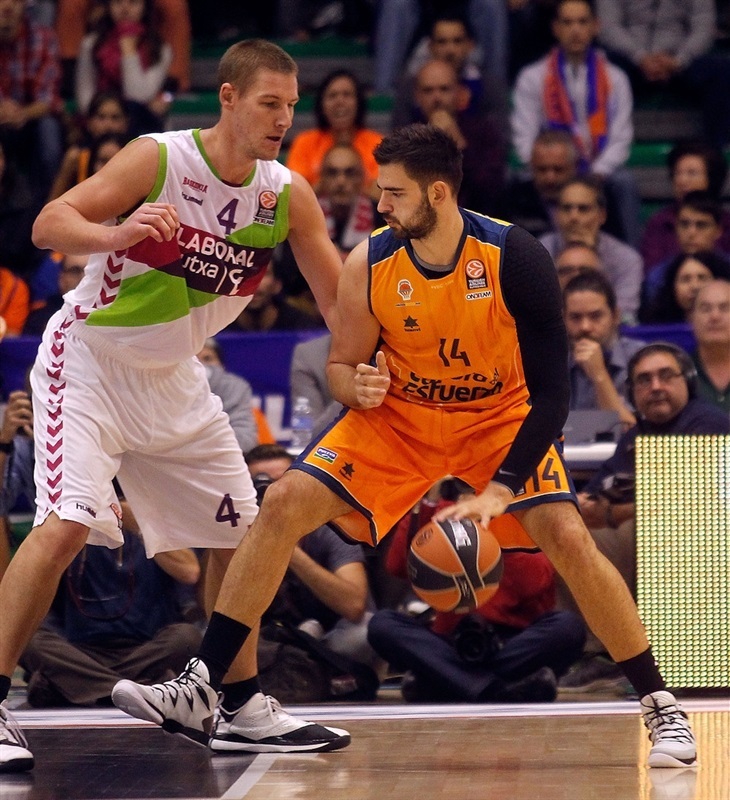 Sam Van Rossom added 14 and 9 assists, Bojan Dubljevic scored 13 points,while Pau Ribas got 11 for Valencia. Toko Shengelia led Laboral with 20 points. Thomas Heurtel added 11 for the guests. Heurtel and Kim Tillie shined early and an effective zone defense allowed Laboral to get a double-digit lead, 11-22. 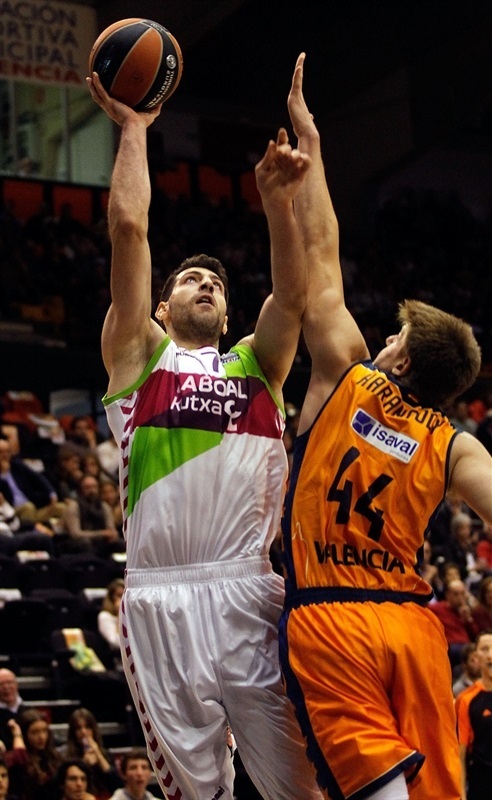 Ribas and Kresimir Loncar brought Valencia within 15-22 after 10 minutes. An outstanding Shengelia helped Laboral restore a 24-34 margin, but Dubljevic and Harangody fueled a 12-0 run that put Valencia ahead, 36-34, at halftime. Shengelia and Sasha Vujacic still kept Laboral within 51-50, but Van Rossom and Harangody stepped up to give Valencia a 65-56 lead after three quarters. Valencia soon boosted its lead to double digits, 73-63, and never looked back. 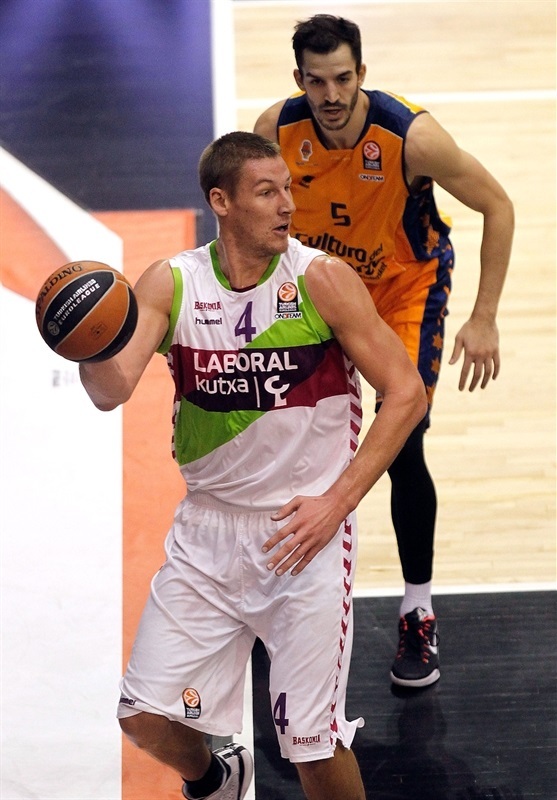 Davis Bertans got Laboral going with a driving layup and a free throw by Shengelia gave the guests a 0-3 lead. Harangody struck from downtown and soon added a fast break layup to give Valencia its first lead, 5-3. After Tillie nailed a corner triple, Dubljevic scored down low. 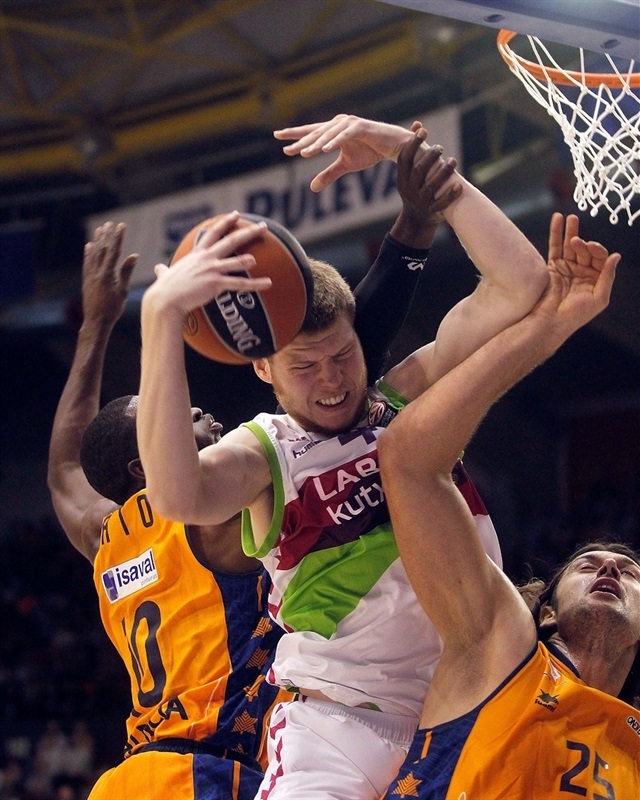 A dunk by Colton Iverson put Laboral back ahead, 7-8. A huge block by Iverson on Vladimir Lucic's dunk attempt allowed Heurtel to hit a three-pointer. Heurtel kept pacing the guests with a layup-plus-foul. Lucic got the crowd involved with a layup off a steal and another triple by Tillie, from the same spot, gave the guests a 10-17 edge. Van Rossom made free throws, but Vujacic did better with a bomb from downtown. Valencia struggled to beat Laboral's zone defense and Lamont Hamilton made it a double-digit game, 11-22. A fast break layup by Ribas and a buzzer-beating jumper by Loncar brought Valencia within 15-22 after 10 minutes. Pablo Aguilar stepped up with a layup early in the second quarter, as the game turned into a physical battle. A free throw by Loncar capped an 8-0 run and brought Valencia within 18-22. Shengelia silenced the crowd with a big slam, but Ribas matched it with a four-meter jumper. Bertans nailed one from downtown. Guillem Vives made free throws and a three-pointer by Shengelia restored a 22-30 Laboral margin. Shengelia soon added a fast break slam, which caused Valencia to call timeout at 22-32. 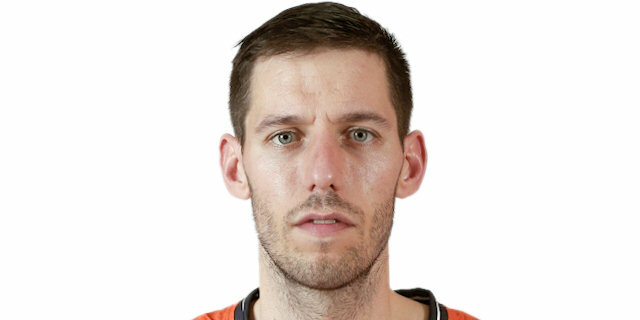 Ribas tried to change things with a mid-range jumper and bettered Fabien Causeur's driving basket with a three-pointer for a 27-34 score. Romain Sato shined with a power layup and Harangody followed a big triple with a layup to tie it at 34-34. A jump hook by Dubljevic completed the hosts' comeback, 36-34, after a 12-0 run. 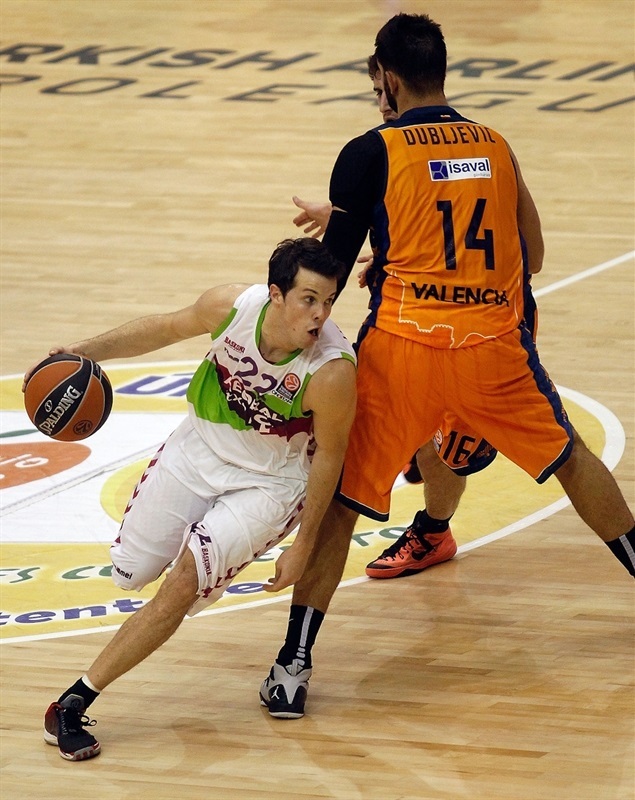 Vujacic made free throws and a layup by Van Rossom gave Valencia a 38-36 edge at halftime. Shengelia struck from downtown immediately after the break, but Dubljevic also hit one from beyond the arc to make it 41-39. Ribas took over with a wild driving layup, which Huertel bettered with a triple in transition. Dubljevic followed a dunk with a layup but a free throw by Shengelia and a three-pointer by Bertans kept Laboral within 47-46. Harangody hit a mid-range shot and a driving layup by Ribas caused the guests to call timeout at 51-46. Shengelia hit a running hook and followed it with a power layup for a 51-50 Laboral deficit. Harangody nailed a three-pointer and Van Rossom also struck from downtown to boost the hosts' lead to 57-50. After Vujacic and Van Rossom exchanged off-balance jumpers, Shengelia made free throws and a layup by Loncar kept Valencia way ahead, 61-54. Hamilton shined with a second-chance layup. 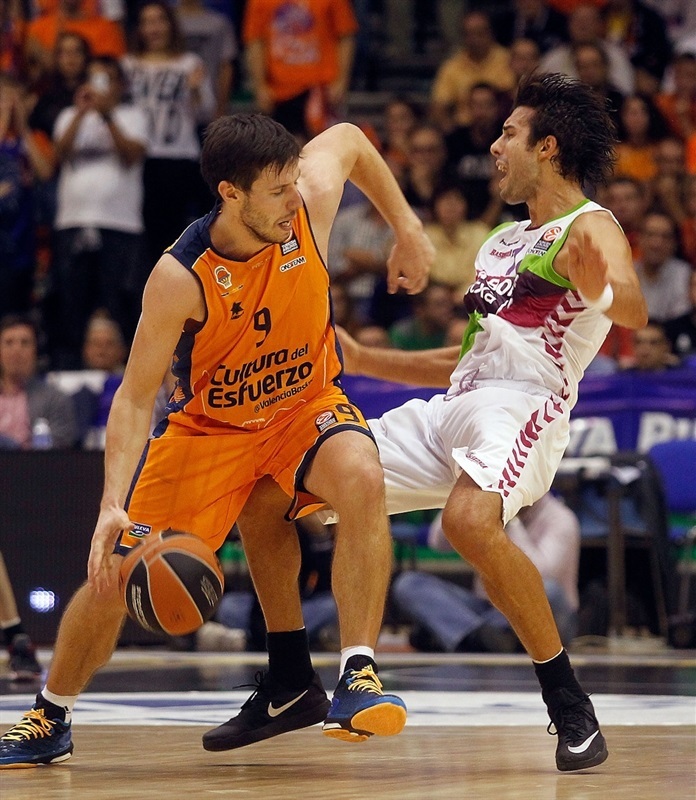 Loncar scored down low and a layup by Vives boosted Valencia's margin to 65-56 through three quarters. Iverson split free throws early in the fourth quarter, as Valencia could not find the way to the basket, even missing fast break layups. Fernando San Emeterio made foul shots and a power layup by Shengelia caused Valencia to call timeout at 65-61. Harangody struck from downtown and Iverson hit free throws, as Valencia entered the foul penalty with seven minutes left. 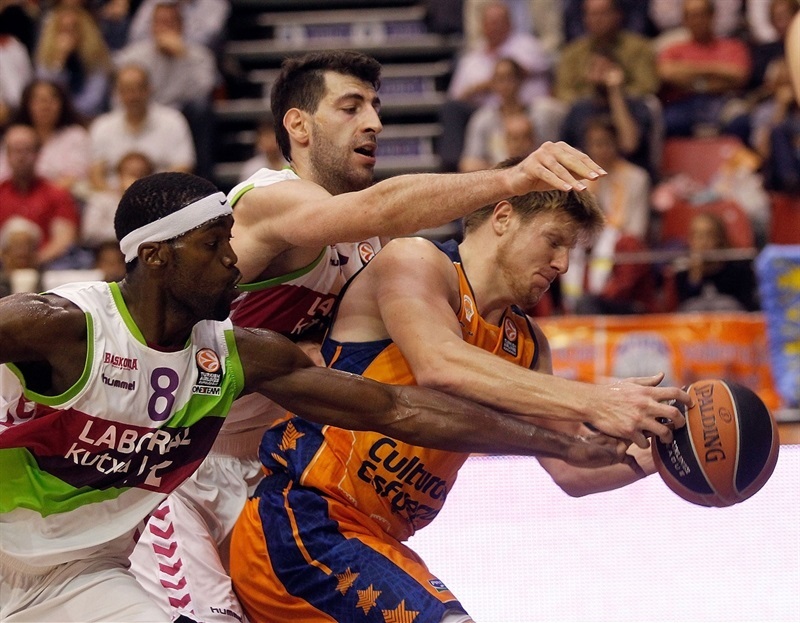 Harangody insisted from beyond the arc and a layup by Van Rossom gave Valencia its first double-digit margin, 73-63. Doron Perkins tried to change things with a layup that Dubljevic matched with a jump hook. 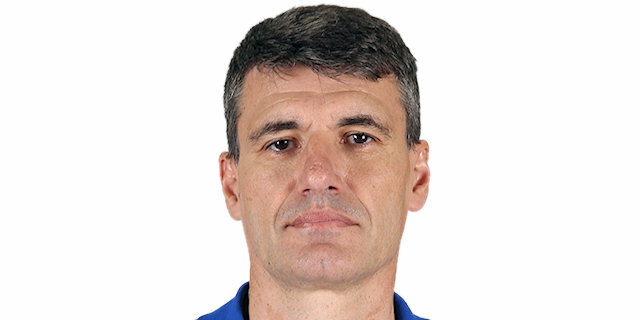 Laboral needed a quick comeback to return to the game, but long shots did not fall in and Valencia forced the guests to use long possessions. Tillie banked in a jump hook, but he didn't find any help around. Harangody rounded out his great game with free throws that sealed the outcome, 77-67, in the next-to-last minute. 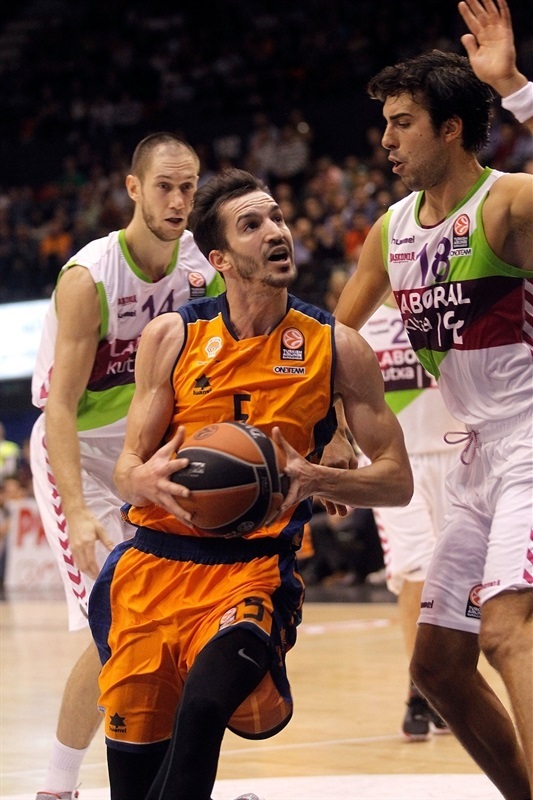 "After three losses in the Euroleague, this win was important for us. We knew that we could have trouble in this game, but the team worked really hard and we were the fair winners. This win brings us back to the fight to advance to the Top 16. It will depend on us, if we play well, we can advance. Laboral plays direct basketball, with few passes and a lot of confidence. Everybody can take three-point shots. They scored 90 points several times. Being able to overcome this moment in which they got fast break points was really important. It was key not to commit turnovers, as that allows them to run the break and get easy baskets. We had few turnovers, 6, when we had 18-19 turnovers lately. It is impossible to beat talented teams like that. That, added to our are good defensive attitude, allowed us to win the game." "Our game changed in every quarter. Our mistake was to stop passing the ball and to allow players to hold it for too long. That, against a good defensive team like Valencia Basket, is a very big mistake. When we played to get out of Valencia's defensive traps, we did well. When we looked for fancy plays, that doesn't work in a Euroleague game. We played a very good first quarter, being consistent on offense and defense. When we were up by 10 points, we stopped sharing the ball and many plays had less than 2 passes." "It was a key game for us to stay alive in the Euroleague. I am very happy with this win. Our defense was good until now, but we struggled to get 70 points in the opening three games. If you want to win, you need to score more than that like we did tonight. We have to play with a lot of energy. We were a bit soft early in the game and that was shown in the scoreboard. When we were 10 down, we started to play with more intensity and aggressiveness and that allowed us to win."